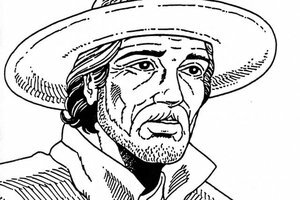 HUAULT DE MONTMAGNY, CHARLES, called by the Indians “Onontio,” first governor and lieutenant-general of New France from 1636 to 1648; baptized 11 March 1601 in the parish of Saint-Paul, at Paris, son of Charles Huault and of Antoinette Du Drac; d. 4 July 1657 on Saint Christopher Island (Saint Kitts and Nevis) in the West Indies. The Huault family goes back at least as far as Henri II, to whom Jacques Huault was a counsellor and a secretary. The Huaults owned extensive estates. They were marquis of Vaires and of Bussy-Saint-Martin (Seine-et-Marne), and seigneurs of Bernay, Montmagny, and Richebourg (Seine-et-Oise). Charles Huault was educated by the Jesuits, and entered the Order of Malta on 3 Aug. 1622. He was posted to the men-of-war of the order, which maintained peace in the Mediterranean area, and he served his apprenticeship there as a naval officer, fighting against the Turks and the pirates from Algiers and Tripoli. In 1632 he was one of the directors of the Compagnie de la Nouvelle-France. 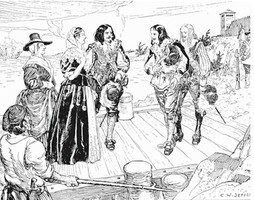 In 1635, while Champlain was still alive, Montmagny was appointed governor of Canada. His family ties with Jean de Lauson (senior), a director of the company, partly explain this appointment. Montmagny’s gifts as an administrator, as well as his personal qualities, had, however, already shown that he was worthy to continue Champlain’s work. His first commission as governor dates from 15 Jan. 1636. 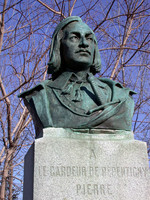 He was therefore the first titular governor of New France, since Champlain bore the title of “commandant in New France in the absence” of Richelieu. Montmagny was to receive subsequently three commissions: in 1639, 1642, and 1645. Charles Huault spared neither strength nor courage in the king’s service. 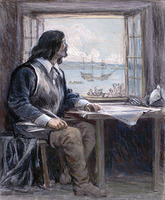 In September 1636, in order to find out for himself what the state of the settlers was, he made a tour of the colony, which took him from Cap Tourmente to the Île Montmagny (Jésus). He was struck by the population’s insecurity, and as soon as he got back to Quebec he gave his attention to the reorganization of the military defences. He ordered the Château Saint-Louis to be transformed into a stone and brick fortress with a garrison. He instructed the engineer and surveyor Jean Bourdon to draw up a plan for the future town, and himself chose the names of the first streets: Saint-Louis, Sainte-Anne, and Mont-Carmel. At Trois-Rivières he built a storehouse and a platform fitted with cannons. The Iroquois were indeed threatening the country. During the occupation of Quebec by the English they had broken the peace concluded by Champlain, around 1622, and in 1634 had again begun their incursions into the colony. Everything might have been settled had it not been for the Dutch from Fort Orange (Albany, N.Y.), who in 1639 began to barter with the Iroquois, giving them arquebuses in exchange for beaver furs. In this way the Iroquois, who were rivals of the Hurons in the fur trade, had an undeniable military superiority, for Montmagny, continuing Champlain’s policy, forbade the French to sell fire-arms to the Indians. Emboldened by the support of the Dutch, the Iroquois formally declared war on the French in 1641. Montmagny held a parley with them at Trois-Rivières in June, but to no avail. The negotiations degenerated into a brief combat, in which the governor was victorious. The dark hours of the colony had just begun. What could 300 settlers (including women and children), scattered between Beaupré and Trois-Rivières, do against an enemy as cunning as the Iroquois? Montmagny hastily blockaded the Richelieu, the traditional Iroquois route. In August 1642 he constructed Fort Richelieu, on the site of the future Sorel, using for that purpose the 40 soldiers who had arrived from France. Montmagny was under no illusions as to the effectiveness of this fort. Consequently he sought peace. In 1645, at Trois-Rivières, he concluded a treaty with the Mohawks; the famous orator Kiotseaeton took an active part in drawing it up. 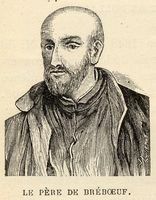 The Jesuit Jogues and Jean Bourdon endeavoured to consolidate the peace by going to the Iroquois country in June 1646. Jogues was to return there in the autumn, but only to meet his death. The Iroquois had already planned the destruction of the Huron country; they were to carry out their scheme in 1648–49, at a time when Montmagny had returned to France. Despite the Iroquois war, important achievements marked Montmagny’s term of office. 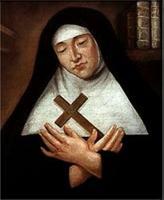 In 1639 the governor was delighted by the arrival of two religious communities who wished to devote themselves to the welfare of the population: the Ursulines, financed by Mme Chauvigny de La Peltrie, proposed to concern themselves with the education of young girls; the Augustine Hospitallers, encouraged by the Duchesse d’Aiguillon, proposed to found a hospital. Then came the founding of Montreal. 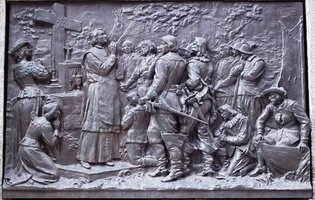 In the autumn of 1641 the first contingent of the Société Notre-Dame reached Quebec. 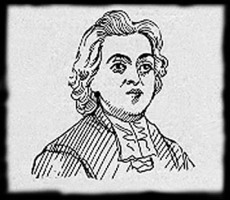 The leader, Chomedey de Maisonneuve, wanted to establish himself on the Montreal Island. Montmagny considered that to choose an island so far up the river and so exposed to Iroquois attacks was a “foolhardy venture,” and urged the Montrealers to establish themselves on the Île d’Orléans. But Maisonneuve stood firm, and Montmagny was obliged to hand over Montreal Island to the members of the society. Subsequently Montmagny always kept the Montrealers at a distance. Perhaps he deemed the project too rash, perhaps also he did not forgive the society for having the privilege of letters patent that granted it a wide administrative and religious autonomy. 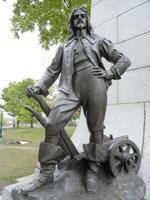 Whatever the reasons may be, Montmagny showed little inclination to assist the Montrealers when they were at grips with the Iroquois in 1647 and 1648; it was even rumoured that he attempted to keep at Quebec the few soldiers at his disposal. After the founding of Montreal came the creation of the Communauté des Habitants; an important consequence of this was the limitation of the governor’s powers. Practically speaking both the civil and the military authority were vested in Montmagny. He saw to the country’s security, held smuggling in check, presided at councils with the natives, and settled disputes arising among individuals. A lieutenant, a clerk of court, and an attorney assisted him in his functions. However, the irregularities that took place in the administration of the Communauté led the Conseil du Roi, on 27 March 1647, to enact a law for “establishing order and surveillance in Canada.” The decree created a council composed of the governor, the superior of the Jesuits, and the governor of Montreal. The council appointed the general and the captains of the fleet, the clerks and comptrollers of the fur trade, in addition to a secretary able to act as a notary public. In fact, the council had jurisdiction over everything that concerned the fur trade and the general interest of the country. Montmagny was replaced in 1648, and it is not known whether this was because of his age, his reserve towards the members of the Société de Montréal, the indecision that had for some time marked his policy towards the Iroquois, or the designs of the Order of Malta in America. The Conseil du Roi, which included the three members of the Société de Montréal, first thought of Maisonneuve as his successor. The latter stood down in favour of Louis d’Ailleboust, who was appointed on 2 March 1648. Montmagny betrayed no acrimony. He received the new governor with elaborate ceremony on 20 Aug. 1648 and sailed for France on 23 September. On his arrival he was appointed receiver of the priory of France by the grand master of Malta. The latter, in 1652, entrusted to him the government of Saint Christopher, in the West Indies. Montmagny died there in 1657. He was remembered after his death as a conscientious administrator, concerned with the progress and well-being of the population, but over-assertive. He never let pass an opportunity to show his compassion for the poor and his friendship for the common people, whom he often invited to public celebrations. Thanks to him, the theatre made its appearance at Quebec: in 1640 his secretary Piraube played the principal role in a tragi-comedy, and on 31 Dec. 1646 the people of Quebec were able to witness a performance of Le Cid. The Indians had named Montmagny “Onontio,” meaning “great mountain.” This name was subsequently passed on to all the governors of New France, in the same way that “Achiendassé,” the name given to Jérôme Lalemant, later designated the superiors of the Jesuits at Quebec. The documentation on Montmagny is scanty, as his correspondence has never been found. JJ (Laverdière et Casgrain) and JR (Thwaites) are the best documentary sources. ASQ possesses about 50 documents relative to the judgments, concessions, and orders signed by Montmagny. See also: Édits ord., III, 15. Ord. comm. (P.-G. Roy), I, 1–9. Inv. 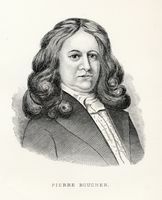 concessions (P.-G. Roy), I, passim. Mémoires des commissaires, I, 156–57; II, 499; IV, 180; and Memorials of the English and French commissaries, I, 211, 365, 715. Among the secondary sources, Gustave Lanctot, in his Histoire du Canada, I, provides useful and precise details and, especially, the historical background. J.-E. Roy has devoted several articles to Montmagny, as well as his L’ordre de Malte en Amérique (Québec, 1888), in which he advances the theory that Montmagny would have liked to make the Château Saint-Louis a fortress of the order. For the reasons behind Montmagny’s departure, the following works may be consulted: BRH, XVI (1910), 11–17; XLVII (1941), 32, and Coll. de manuscrits relatifs à la Nouv.-France, I, 249. See also E. R. Adair, “France and the beginnings of New France,” CHR, XXV (1944), 246–78. J.-C. Dubé, The chevalier de Montmagny (1601—1657): first governor of New France, trans. Elizabeth Rapley (Ottawa, 2005). 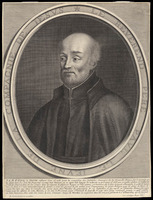 Jean Hamelin, “HUAULT DE MONTMAGNY, CHARLES (“Onontio”),” in Dictionary of Canadian Biography, vol. 1, University of Toronto/Université Laval, 2003–, accessed April 21, 2019, http://www.biographi.ca/en/bio/huault_de_montmagny_charles_1E.html.